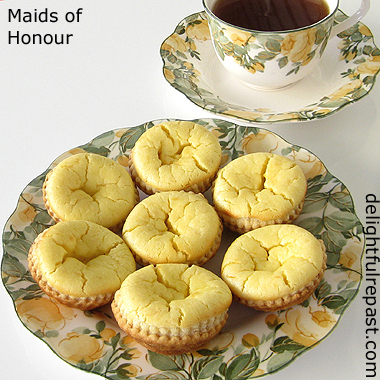 Maids of Honour Tarts, also called Richmond Maids of Honour, are said to date back to Tudor times and have had a tearoom/bakery devoted to them since 1850 not far from Henry VIII’s home, Hampton Court Palace, in the southwest London borough of Richmond upon Thames. Not a custard tart, the filling is more akin to cheesecake than custard. The primary ingredient is curd cheese, something even people in England sometimes have trouble finding. With a name like that, you’d think cottage cheese would be the best substitute. But no. Cottage cheese, even pressed through a sieve, is not similar to curd cheese. Curd cheese is, so I’m told, more like Neufchatel cheese (also called 1/3 less fat cream cheese), in both texture and fat content. Though my filling cracked on top, the texture was perfectly smooth and lovely. If you don’t have a 12-cup shallow bun tray/patty tin or mince pie/jam tart tin or tartelette pan, those are two I have and recommend. Or you could use a standard muffin tin, though it might be more difficult to get the tarts out. Don't worry about the cracks. Both the taste and texture are superb. These are going on the menu for my next afternoon tea party, but I'll be making them even before then because Mr Delightful loves them! 1 Remove frozen pastry sheet from box and wrapping. Thaw at room temperature for 30 to 40 minutes, until pastry unfolds easily but is still cold. Remove egg and cheese from the refrigerator and let cheese soften at room temperature for same length of time. 2 Preheat oven to 350F/180C/Gas4. Spray with cooking spray, or lightly butter, a 12-hole shallow bun tray/patty tin/tartelette pan. If you don’t have one, you may use a standard muffin tin. Note: Some people bake them at 400F/205C/Gas6, probably thinking that's best for the pastry, but the pastry is fine and the filling is much better baked at the lower temperature. 3 On lightly floured surface, roll out thawed pastry to about 9.5x12.5 inches/24x32 cm (pastry should be very thin) and with 3-inch/7.5 cm cutter, cut out 12 circles. Fit the pastry circles firmly into the tin, but do not stretch the dough. Place in freezer while you make the filling. Melt the butter and leave it to cool. 4 In small mixing bowl (I use a 1-quart glass measure), mix together the softened cheese, sugar, almond flour, lemon zest and lemon juice. Beat in the egg and then the melted and cooled butter until thoroughly combined. Spoon the filling into the tart shells, filling them nearly to the top. Bake for about 25 minutes, until puffed and golden. 5 Let cool in the tin for 5 minutes before removing to wire rack to finish cooling. They will sink a little as they cool. You may give them a very light dusting of powdered sugar (icing sugar), if you like, just before serving. They look wonderful! And I love cheesecake tarts. Thanks for sharing another beautiful recipe, Jean. Thanks, Angie. I love cheesecake tarts, too. And custard tarts. This texture might be somewhere between a cheesecake tart and a custard tart. I haven't eaten one of these for quite a while - probably since the last time I went to the famous tea room. They do look good. I've heard so many food origin stories that turn out to be a little fanciful that I'm not too certain that these were the very sweetmeats eaten by the ladies of the long gone Richmond palace but I am sure it's a very old recipe. My local supermarket does sell curd cheese sometimes but it always makes me think of Yorkshire curd tart rather than the more local Maids of Honour. Shame on me. 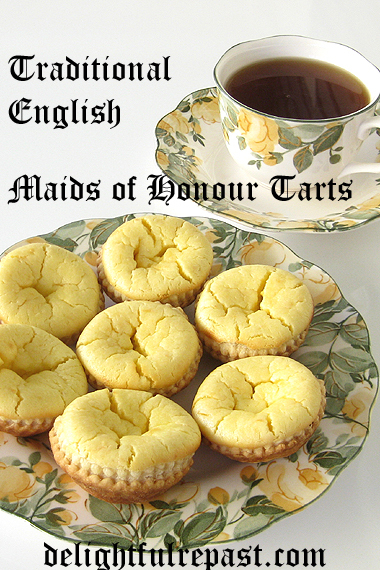 Re: maids of honour tarts! You can’t come up with a better name than that, he said with a cheesy smile. I’m game. Probably needs more sugar – couple gobs of Sander’s hot fudge or caramel or maybe some black cherry glurp – but as long as it’s moist, and it appears to be, I’ll hold off on that. Phil, I don't buy the story either! Definitely "a little fanciful," if you ask me. But oh these are soooo good! Still, Yorkshire curd tarts are on my list and you can expect to see them as soon as they work their way to the top. Sully, thanks, this is practically a rave review! You noticed the low sugar, BUT did you notice the LEMON! Lemon zest and lemon juice. What beautiful tarts, Jean, and I enjoyed reading the history behind them as well! I think we may call curd cheese Quark here in the south of England...but I'm not a hundred percent sure as I haven't used it in baking before. I'd definitely like to try these lovely tarts - and I adore the name of them! Thank you so much for your support of the Hearth and Soul Link Party. I hope you have a lovely weekend! April, thank you. I know you would love these. Quark might or might not work in these. I read that the fat content of quark can be anywhere from 1% to 40%, whereas the curd cheese and Neufchatel cheese both are around 21%. So look for a quark with about 6 grams of fat per ounce of cheese. The history of food is so interesting. I've never eaten one of these tarts; they look delicious. Lorrie, thank you! These are so easy to make and come together quickly, so I hope you'll try them. Perfect with a cup of tea! Oh my, these look like a great treat. I know I'd enjoy them. Thanks for the recommendations, too. I saw a recipe for these many years ago and I have always been curious about them. I'm sure I don't know where the recipe is now but I may give these a try especially since they can be made with a low fat cream cheese. 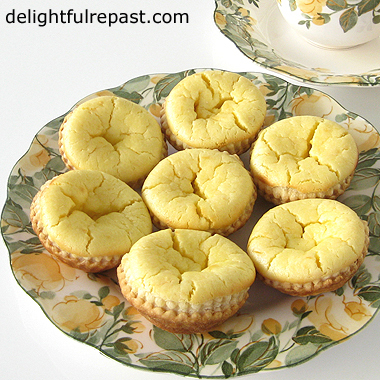 A tart is such a sweet little dessert to enjoy with a cuppa. I do love the history of old recipes and find them fascinating! Thanks so much for sharing it with us. They look lovely and I really appreciate hearing the history of them, too. And I love how they look staged with your pretty china! Jean they look really good! In Wisconsin cheese curds are available. Ellen, you are so welcome! I so appreciate your visits and thoughtful comments. Sandi, thank you. I know you will enjoy these. Do make them and let me know your thoughts. Thank you, Jeanie. I love that china, too. And I only have two place settings of it, one in pink and one in my favorite yellow. Jan, I'm so jealous! The only time I was within striking distance of the MOH Tea Rooms and Kew, I never made it to either. What a lovely memory to have of being there with your parents! Linda, good to know! I've never heard of Wisconsin cheese curds before. Will look into it. Thank you. I think I better go fix dinner, Jean. You're making my mouth water with these. Yum! I've saved to make later. Have you considered quark as a substitute cheese? My mother-in-law made a "Maid of Honor" tart that was different from this recipe, it was my favorite tart that she made. She was English and sure could do pastry well. Her tarts were made with rice flour and filled with raspberry jam in the bottoms, then a thin layer of icing. They had an almond flavouring. Thanks, Sue. I've read that quark's fat content can range anywhere from 1% to 40%, but that the Neufchatel fat content is about the same as that of curd cheese. So if you see some quark that has about 6 grams of fat in 1 ounce of cheese, that would be a good possibility. Debbie, what your mother-in-law made sounds to me like a Bakewell Tart. Check this out and see if they are similar: https://www.delightfulrepast.com/2016/10/bakewell-tart-british-classic.html I do the version with almonds on top, but there's also a version with icing on top instead of almonds. Thanks for the info; I'll look into it further. I love cheesecake so I'm sure that I'll enjoy these tarts. This is the first time I've heard of "curd cheese". Interesting! How wonderful! I know of the tearoom but had no idea it was named after an actual tart. Thank you, as always, Jean. Thank you, Margie. They would be a good thing to take to work for one of your tea socials! Pauline, these are so easy to make, too! And they don't have a lot of sugar. mini cheese cakes, I love it! Not too heavy on the sugar or carbs. Nice. I think my wife is going to like this one. And Valentine's is just around the corner. Thanks, Richard. Yes, not too heavy on the carbs, and just 1 teaspoon of sugar per tart! Wouldn't it be fun to find some curd cheese to make these. They look beautiful Jean. Love finding special recipes like this. Henry VIII ‘s needed a lot of these delicious looking cakes with his eight wives. There is a danish cheese place where I can buy curds. Poor Henry, right, Gerlinde? Was he what they call "unlucky in love"? :D Do let me know if you make these, with curd cheese or with a substitute. Thanks for the hot tip, Judy! Just one more reason to visit Wisconsin! They do taste good and I am sure your version is just as good, Jean. Thank you, Tony. Glad you weighed in on this post since you're so close to the very centre of Maids of Honour. I hope you'll give the recipe a try, even though you can so conveniently go out for them any time! These sound wonderful, Jean. I have the perfect little tart pans and can’t wait to try the recipe. David, I knoooow! But English maids of honour just don't draw the crowds that "French tarts" do! :D Let me know how they turn out for you. These look yummy. I must try making them. Thanks! My wife and I are hooked on "The Great British Bake-Off" and these look right at home there - I'd love to try these one day! Thanks, Darlene. I hope you will! Thank you, Unknown. GBBO is such fun, isn't it! If you try these, do let me know how you liked them. I've never heard of these before Jean - they sound delicious (as do all your recipes!) and I'd never heard of curd cheese before either - I learn something new every day! Oh Jean, how I'd love to have a Maid of Honour with you at your pretty tea!!! The plate and teacup are such a beautiful pattern. I have never heard of this delightful treat, but I'd love to taste one. Thanks so much, Kitty. You and Cissy could whip some up on your next baking session! What a lovely tea and your tea set is so special.Your Maids of Honour will be such a delicate treat. Which I was sitting at your tea table! Hope you are having a great week and thanks so much for sharing your awesome recipe with us at Full Plate Thursday! Thanks so much, Miz Helen! Always a pleasure to join #FullPlateThursday! I've seen curd cheese, but not all that often. Definitely not something I can expect to find at the supermarket, so glad to hear there's a substitute. 'Cause I want to make these! Great looking recipe, and one that's new to me -- thanks. Thanks, John. They have a wonderful flavor and texture. My husband is addicted to them! I have made these before and love the whole historic fun! Bernideen, I was sure you'd made these before. You and I both love "the whole historic fun!"